Sumperk's photogenic red and blue 751s handle freight traffic over the Hanusovice - Jesenik line. 751 052 was pictured working north through Branna with Mn81761 on 25 April 2006. 749 254 arrives at Horni Lipova with R757, the Plzen - Jesenik passenger, during a violent thunderstorm on 26 April 2006, passing 851 005 on southbound local Os3608. 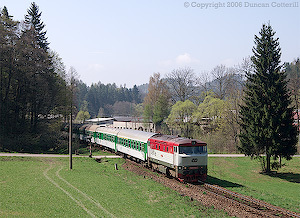 The tranquility of the Jesenny Valley is shattered by the roar of a pair of unsilenced class 751s dragging Mn81830 up the hill from Lipova Lazne to Ramzova on 26 April 2006. 751 052 is in the lead with 751 041 bringing up the rear. As well as the 751s, 749 259 was working in the freight diagram. It was photographed rolling down through Ostruzna on 27 April 2006. During my visit 749 248 was the regular power on R925 and R924, the Brno - Jesenik and return passengers. 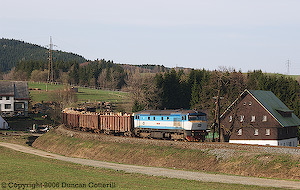 The picture shows it climbing from Branna to Ostruzna on 28 April 2006. 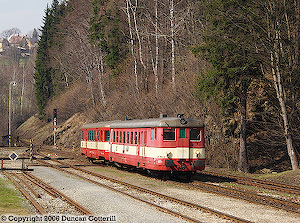 The Jesenik line is one of the last haunts of the ancient class 831 railcars. 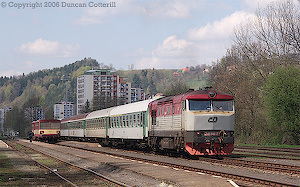 831 110 was seen arriving at Branna with Os3610 from Jesenik to Sumperk on 25 April 2006. Celebrity 749 006 runs round at Tanvald after arriving on R942 from Praha on 29 April 2006. Compare the more rounded features of the original T478.1 with the slightly more angular style of the majority of classes 749 and 751. 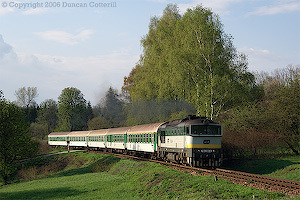 749 146 departs Zelezny Brod with R942, the Praha - Tanvald train on 01 May 2006. This working is only booked for loco haulage on weekends and public holidays. The class 150 "Gorillas" have largely been relegated to the secondary route from Praha to Hradec Kralove in recent years. This line hardly tests their 140 km/h maximum speed and 4000 kW power output but they look good all the same. 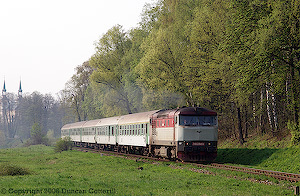 150 021 was photographed pulling away from Podebrady with R954, the 16:14 Hradec Kralove to Praha Smichov on 01 May 2006. 749 254 accelerates away from Letohrad with R251, the daily Praha - Poznan express on 06 May 2006. 751 080 and 751 104 were regular performers on the Letohrad - Miedzylesie freights during my visit. 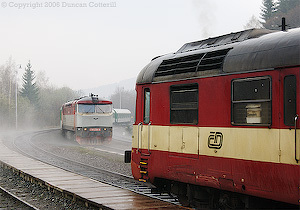 The pair are seen here at the junction of the Miedzylesie and Hanusovice lines east of Lichkov. The back of the train is still in Poland. 080 was in appalling external condition with the paint falling off the front in great lumps. 104 wasn't much better. On a couple of occasions, Letohrad turned out passenger engines 749 011 and 749 008 instead of the usual 751s on freights to Miedzylesie. 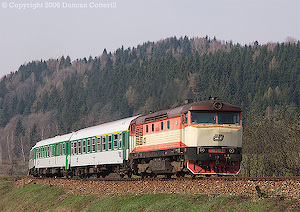 The pair, both very clean, were photographed approaching Jamne nad Orlici on 03 May 2006. 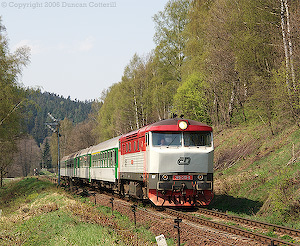 The daily pick up from Dolni Lipka trundles towards Letohrad behind 742 220 on 04 May 2006. 749 019 was a regular performer on R757, the daily Plzen - Jesenik passenger. It's seen here north of Jamne nad Orlici on 03 May 2006. 749 019 on R757 again, this time captured approaching Lichkov on 05 May 2006. The spot just west of Lichkov (above) was alive with snakes. This adder was one of a number that lived there. They aren't aggressive creatures but are moderately poisonous and can bite if they feel threatened. They proved to be very camera shy and generally slithered off when they became aware of my presence. A long telehoto lens was needed to get this shot. As well as the 749s, a couple of 750s were also working in the passenger diagram. 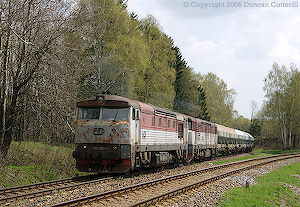 750 258 was photographed between Letohrad and Vermerovice with R251 on 04 May 2006. Class 111 "Irons" spend most of their time shunting at numerous places on the 3kV DC network but they also work most passenger trains on the short link from Usti nad Orlici to Letohrad. 111 018 heads out of Letohrad bound for Usti n/O with Os15066 on 06 May 2006. The Hanusovice - Jesenik line had been on my to-do list for some time and two weeks holiday at the end of April finally provided a suitable opportunity for a visit. The rest of the trip was spent avoiding the rain in Ceska Trebova and photographing the loco hauled passengers and heavy freights on the Letohrad - Lichkov line. Flights to Praha were with CSA and travel within the country was by rail using a first class Sitove Jizdenka (network ticket). Details of locos and workings seen can be found on the sightings page. This is a gem of a line, running through superb scenery and hosting an eclectic mix of freights, loco hauled passengers, and vintage railcars. There are some 810 or 843 workings to spoil the party but most trains are worth photographing. 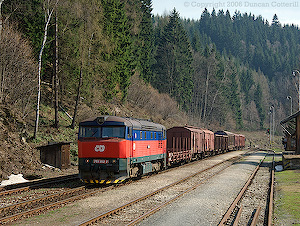 Freight trains are worked by Sumperk based class 751s, most of which carry an attractive red and blue livery and are unsilenced. The sound of a pair of these locos lifting a heavy train of timber out of Lipova Lazne, round the curves at Horni Lipova and up the hill to Ramzova is memorable. For a few minutes the whole valley fills with the roar of hard working K6S310DR engines before tranquility finally returns. Well worth experiencing at least once. The freights were remarkable for consistently running spot on time. The three booked daylight trains ran every day and apart from 1 train that was about an hour late on 1 day, all were within a few minutes of right time. As well as the expected 751s, blue and white 749 259 was also working in the diagram. Most southbound freights take a banker from Lipova Lazne to the summit at Ramzova although the returning goods from Javornik ve Slesku is booked to be banked all the way from Vapenna on the branch. Passenger trains are also of interest. From around 08:00 to 14:00 a procession of vintage railcars and loco hauled passengers work north over the summit at Ramzova, returning south between 12:00 and 17:00. There are loco hauled passengers from Brno and Plzen every day, hauled by Sumperk and Letohrad based 749s respectively. Of the remaining passengers, two pairs are worked by class 831 railcars and another pair by a class 851. At weekends another Sumperk 749 works an extra pair of passengers and there's an additional class 851 working as well. On Wednesday afternoon and Thursday morning 749 250 covered one of the 843 turns, working Sp1933 (14:41 Olomouc - Jesenik) and Sp1702 (17:42 Jesenik - Zabreh n/M) on Wednesday and Sp1930 (06:57 Jesenik - Olomouc) the following day. Everything else ran with the booked traction. See below for more details. Much of the line runs through forest and there aren't that many good photo positions. Most of those that do exist are easily accessible though. A number of good spots for the morning northbounds can be found on the section between the main road level crossing and the road underbridge south of Ostruzna. Ostruzna station is also pleasant but needs to be done early before the light goes round too much. For the afternoon there are positions on the curves at Ostruzna and north of Horni Lipova while Branna station is also very good and largely free of ugly lampposts. There should also be some good shots for the Javornik goods on the branch but I didn't have time to investigate beyond Lipova Lazne Jeskyne. In spite of forecasts predicting almost continuous cloud and rain every day, the weather was actually very good with every day sunny until late morning and then again from late afternoon. There were variable amounts of cloud from midday until late afternoon with a few light showers on most days. On Wednesday the TV weather forecasts showed predicted rainfall maps every two hours throughout the day with Jesenik well and truly in the wet area in every single one. In reality it was cloudier than usual with a torrential thunderstorm in the middle of the day but the morning and evening were sunny as usual. Accomodation was at the Hotel Stanic in central Jesenik. It claims to be 3 star but although the facilities were adequate, they were nearer 2 star standard in my estimation. From the station forecourt, turn left and descend the pedestrian ramp that leads to street level. Keep going in the same direction down the street until you cross the river bridge then turn right, passing a parade of shops on your right. Keep straight on through an alleyway and you come out facing the hotel across the main road. Walking time approx 10 minutes. The Hotel Morava is right outside the station but appeared to be undergoing repairs and wasn't investigated. At Ramzova, the Hotel Neubauer (good Czech name) is just across the main road from the station. It boasts 3 stars and looks good from the outside but it was closed on the day I tried to get something to eat at lunchtime. Ramzova caters for skiers and hikers so it may only be open during the skiing and hiking seasons, whenever they are. Every time I visit Ceska Trebova, the skies cloud over and the rain lashes down. If I get any shots in the sun then they're usually taken many miles away. This trip was no exception with cloud and rain all day Saturday, Sunday and most of Monday. I stayed at the excellent Hotel Korado in the main square as usual. Saturday was spent travelling around various lines north of Praha, checking out potential photspots and enjoying the scenery. My route took me from Ceska Trebova up the main line to Kolin then cross country to Mlada Boleslav and on to Tanvald on R942, the infamous loco hauled (at weekends) working from Praha. My luck was in. A wonderfully vocal 749 006 was on the front and provided outstanding audio entertainment all the way. The sun even came out while the loco was running round allowing a couple of reasonable shots, the only ones that day. After that the rest of the journey was a bit of an anticlimax. A bumpy railbus ride to Liberec, followed by a muted 749 213 on R694 to Ceska Lipa, another railbus to Decin via Jedlova and then EuroCity luxury back to Ceska Trebova. At Jablonec nad Nisou, between Tanvald and Liberec, there was to be an electric line running parallel to the CD line for some distance to the west of town. The overhead equipment appeared to be of the standard railway type with catenary and contact wires but the rails, although laid on ballast, looked to be tramway type and the curves were very tight in places, particularly at the passing loops at stations. The impression I got was that it was probably some sort of interurban operation. It would be interesting to know more. Sunday's excursion took me west to Tyniste nad Orlici to pick up R757 with 749 254 all the way to Jesenik. Although I'd just spent 5 days there the weather was never bad enough to abandon photography and explore the lines to the east and north. From Jesenik, my route took me east, through Glucholazy in Poland to Krnov, then on to Opava, back to Krnov then down to Olomouc, all by railcar. From Olomouc, it was straight back up the main line to Ceska Trebova. Quite a boring day overall with little scenery of interest after Jesenik, apart from the Krnov - Olomouc line, which was superb but very overgrown for much of it's length. This was the only day of the whole trip that I didn't get a single shot in the sun. Monday promised to be a better day in the west so that's where I went, initially retracing Saturday's steps to Mlada Boleslav and up towards Tanvald. As it was a holiday, R942 was loco hauled but by a quiet 749 146 this time. Still it made a nice picture leaving Zelezny Brod where I got off. If the weather had remained bad the plan was to return to Ceska Trebova via Trutnov but the sky was clearing nicely and my shutter finger was getting itchy. The afternoon was spent north of Podebrady, between Nymburk and Kolin. Chris had alerted me to a spot near to Velke Zbozi earlier but it turned out to be slightly closer to Podebrady, assuming that I found the same place. As the two stations are only 2 km apart it's of little consequence anyway. The afternoon was busy with hourly Praha - Hradec Kralove expresses, hourly Praha - Kolin locals and 2-hourly Usti nad Labem - Kolin expresses as well as a good number of freights. Motive power was quite varied as well, although 163s predominated, appearing on the Usti expresses, some of the Hradec Kraloves and a few freights. The remaining Hradec Kraloves were 150s and the other freights had 122s, 123s, 130s and one DB 180. The locals were all class 451 or 452 EMUs. By Tuesday it was time to move on to do some more diesels on the Letohrad, Lichkov - Miedzylesie route. With class 742s progressively taking over the remaining diesel hauled freights in the Czech Republic, the Letohrad - Lichkov - Miedzylesie (Poland) line is one of the last bastions of traditional heavy freight operation with pairs of class 751 diesels. It's also a very scenic route running up the valley of the Ticha Orlice river through the attractive wooded hills typical of this part of the country. The line forms part of an important freight route linking Poznan, Wroclaw and western Poland with the Czech Republic, Austria and southern Europe via the major marshalling yard at Ceska Trebova. It typically sees 2 to 4 freights each way per day in daylight. In addition there are two loco hauled passengers each way and a class 742 hauled pick up goods. The passengers run from Plzen to Jesenik and from Praha to Poznan and are hauled by Letohrad based class 749s between Tyniste nad Orlici and Jesenik or Miedzylesie respectively. The rest of the sparse passenger service is worked by class 810 railbuses. After leaving Ceska Trebova the weather returned to a similar pattern to that seen at Jesenik with clear mornings and evenings and variable amounts of cloud from midday until late afternoon. Accommodation was at the excellent Hotel Filipinum in Jablonne nad Orlici, same as on my last visit in October. A typical day around Lichkov would see the pick up goods working through from Letohrad to Dolni Lipka before 07:00 followed by freights Rn44255 from Letohrad and Pn44256 to Letohrad crossing around 09:20. A 749 would follow to Miedzylesie light engine around 09:40, returning at 11:00 with passenger R250 from Poznan and crossing R757 to Jesenik with another 749. The locos that took Rn44255 to Miedzylesie would usually return on freight Pn47274 around 11:30. Somtimes a pair of light engines would go to Miedzylesie around midday to return on freight Pn44260 around 14:00. Passenger R756 from Jesenik was due at 15:13 and was normally followed towards Letohrad by the pick up goods around 15:45. Around 16:15 freight Pn44265 arrived from Letohrad followed by R251 to Poznan at 17:45. Freight Pn44268 would then return from Miedzylesie around 18:45. Freights generally operated within 30 minutes or so of the booked time. Apart from the pick up goods trains, which don't work on Sundays, all the above trains can run 7 days a week but like most freights aren't guaranteed to run every day. On Saturdays, Sundays and holidays there's an 810 working to Miedzylesie in the morning that's booked to be piloted by the 749 that goes to Poland to collect R250. In January the 749 was following 15 minutes or so behind the railbus but this time it was piloting as diagrammed. This line was visited for the morning only. As expected, the passenger service was in the hands of class 111s with filthy green 111 018 and 111 019 on duty. The loco I was after, clean orange 111 032 was nowhere to be seen although it had been in use the previous weekend and was out again the following day. Freights Rn44255 and Pn44256 ran wih 130 035. As Chris reported, many of the freights on the main line through Ceska Trebova have gone over to class 163 haulage but a few of the older class 181 and 182 do remain in active use. 181 112, 181 116 and 182 072 were all seen at work on various occasions between Ceska Trebova and Nymburk. Although the class 151s were working as normal for most of my trip, there was something strange happening on Sunday 07 May. While returning from Jablonne to Praha via Tyniste nad Orlici, Hradec Kralove and Nymburk, I was surprised to see 151 001 coming the other way on R753, a Praha - Letohrad train. Normally 151s don't stray far from the Praha - Ceska Trebova - Ostrava main line and wouldn't be seen on the secondary route to Hradec Kralove. The loco carries a very distinctive dark blue livery with lightning flashes, so it couldn't be mistaken for anything else. At Praha IC587 and Ex521, both diagrammed for 151 haulage were seen leaving behind 162s. There's obviously something going on but I'm not sure what and didn't have long enough in Praha to find out. An unidentified class 363 was seen at Kolin on a Praha - Brno train in a red and yellow Postovni Sporitelny (Post Office Savings Bank) livery on 29 April. Another loco, or possibly the same one, was seen leaving the south end of Praha hl.n with a train for Ceske Budejovice on 07 May. The Jesenik line exceeded expectations with plenty of interesting and photogenic trains, excellent scenery, predictable freight traffic and good weather much of the time. The variety offered by the 831s and 851s added considerably to the enjoyment as did the varied liveries of the 749s and 751s. My one regret was not having a video camera to capture the fantastic sound of the 751 hauled freights as well as their images. What a good excuse for a return trip in the not too distant future. Letohrad - Lichkov was good but after Jesenik it had to be a bit of an anticlimax. The scruffy state of the most active pair of 751s didn't help although it was nice to see 749 011 and 749 008 out on a couple of freights as well. The passengers were more interesting, with a couple of 750s running in the same diagram as the 749s. 750 312 was the noisiest loco on the line by quite a margin. The daytime Poznan trains in this year's timetable are a very welcome addition. The sparseness of the local passenger service severely limits movement between photo positions. This is one line where using a car is clearly an advantage. The pictures around Ceska Trebova remain elusive (and I have a long list of locations I'd like to try) but in some ways the wet weekend wasn't such a disaster. For a start, it allowed my worn out feet to recover from the miles of walking on the Jesenik line. It also gave me time to explore some new lines, enjoy the delights of 749 006 and get a few good shots on the Tanvald line and around Podebrady. 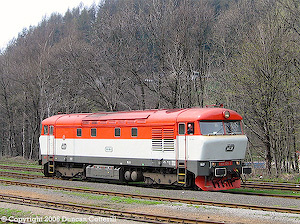 The 749s and 751s are disappearing from the Czech scene along with the old railcars, the semaphore signals and everything else that makes the railways special. In a few years Czech Railways will probably be as sterile and uninteresting as those in the UK. Go now while there is still plenty to see. You won't regret it.